Hotel costs for First Lady Michelle Obama to see cultural sites in Venice during the last leg of her trip overseas is costing taxpayers $128,781. The First Lady left for London and Italy on Monday for her "Let Girls Learn" initiative and anti-obesity campaign Let’s Move. During the trip she will cook with children, visit U.S. service members stationed in Italy, and visit Prince Harry. 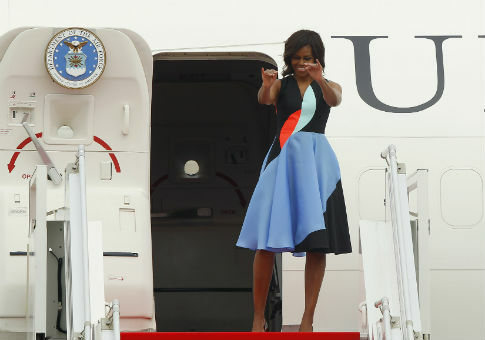 "From London, the First Lady will travel to Milan," according to the White House press office. "As part of her Let’s Move! initiative, the First Lady will lead a Presidential Delegation to the Milan Expo 2015, representing our steadfast commitment to a healthier nation." The delegation is entitled "American Food 2.0: United to Feed the Planet." "Mrs. Obama and the Delegation will also participate in a cooking activity with children," the press office said. "In addition to visiting the U.S. Pavilion, the First Lady will meet with Prime Minister Renzi, and tour the Italian Pavilion with Ms. Landini, the Prime Minister’s wife." "From there, the First Lady will travel to Vicenza, Italy," they said. "As part of the Joining Forces initiative, Mrs. Obama will visit members of the military and their families stationed at U.S. Army Garrison Vicenza." "The First Lady looks forward to personally thanking the service members and their families and reminding them that their sacrifices have not gone unnoticed by the American people," the press office said. "The First Lady will also visit cultural sites in Venice before returning to Washington, D.C.," the statement concluded. A State Department contract for "Lodging for FLOTUS Venice," shows costs of $128,781. The American Embassy in Rome awarded the contract, which was signed June 10. This entry was posted in Issues and tagged Government Spending, Let's Move, Michelle Obama. Bookmark the permalink.